Those of us who scan over UFO sighting reports on a daily basis normally see witnesses send in reports from all corners of the earth. These reports generally are spread fairly evenly across the United States and Great Britain, with a few from other countries. But, now and then, we begin to see an unusually large number of reports from one location. Lately, an abnormal number of reports have come from Michigan, which is a state with a rich UFO history. This recent "flap" of sightings began in August, and continues to this day. Here is a bit of history of famous UFO sightings in Michigan, followed by sighting reports from the recent wave. One of the most well known cases in Michigan involves the loss of the lives of pilot Lieutenant Felix Moncla, Jr., and the normally forgotten radar operator, 2nd Lieutenant R. Wilson. When an Air Defense Command Ground Intercept radar controller at Truax AFB picked up an unknown target on November 23, 1953, an F-89C Scorpion jet was scrambled from Kinross Field. Pursuing the UFO at 500 mph, the Scorpion gained ground, but the UFO abruptly changed course. Moncla had difficulty tracking the UFO on radar, and relied on ground control to point him to the object. After 30 minutes of chasing the UFO, the Scorpion began to bridge the gap on the UFO, now over Lake Superior. Finally, according to ground control, Moncla and Wilson flew close enough to their target that the two radar blips merged into one. Thinking that the Scorpion had flown over or under the UFO, it was expected that the one blip would soon become two again. This was not to be. To the operator's surprise, there was no radar return at all. Messages to the Scorpion went unanswered, and an emergency message was sent to Search and Rescue. The last position marked was off of Keweenaw Point. The Search and Rescue team, though making an all out effort, came up empty. The official conclusion to this mystery was: "... the pilot probably suffered from vertigo and crashed into the lake." Several alternative explanations were offered, all without evidence. One even claimed that the Scorpion exploded in mid air. But, if so, what happened to the UFO? Or was there a mid air collision? We may never know. On March 31, 1966, Hungarian refugee, Jeno Udvardy, was driving home from work in the early morning hours near Vicksburg. As he came over the crest of a hill, he was shocked to see a grouping of lights on the road ahead. He thought it might be an ambulance, or other emergency vehicles. He slowed down as he edged closer to the lights ahead. He soon realized the lights were coming from a disc-shaped object, hovering just above the road. When within about 10 feet of the lights, he suddenly realized that they were not on any recognizable vehicle. Instead they were on a disc-shaped object hovering a few feet above the road and blocking his passage. The lights were so intense it made it was difficult to discern the exact shape of the UFO. He soon felt his car moved by what seemed to be a great gust of wind. 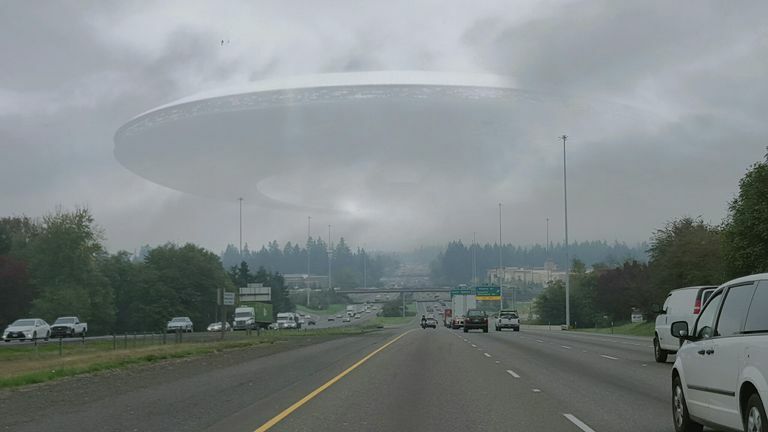 Looking behind his car, he saw what he thought was another UFO, but looking back, he realized the first object had somehow moved from the front to the rear of his vehicle. Trying to make an escape, he found that his car would not start. How many UFO cases have you seen where authorities made a statement similar to this? Washtenaw County deputies B. Bushroe and J. Foster formally stated: "This is the strangest thing that [we] have ever witnessed. We would have not believed this story if we hadn't seen it with our own eyes. These objects could move at fantastic speeds, and make very sharp turns, dive and climb, and hover with great maneuverability. We have no idea what these objects were, or where they could have come from. At 4:20 AM there were four of these objects flying in a line formation, in a northwesterly direction, at 5:30 these objects went out of view, and were not seen again." 3:50 AM - Received calls from Deputies Bushroe and Foster, car 19, stating that they saw some suspicious objects in the sky, disc, star-like colors, red and green, moving very fast, making sharp turns, having left to right movements, going in a northwest direction. 4:04 AM - Livingston County [sheriff's department] called and stated that they also saw the objects, and were sending car to the location. 4:05 AM - Ypsilanti Police Dept. also called stated that the object was seen at the location of US-12 and I-94 [intersection of a U.S. and an Interstate highway]. 4:10 AM - Monroe County [sheriff's department] called and stated that they also saw the objects. 4:20 AM - Car 19 stated that they just saw four more in the same location moving at a high rate of speed. 4:30 AM - Colonel Miller [county civil defense director] was called; he stated just to keep an eye on the objects that he did not know what to do, and also check with Willow Run Airport. 4:54 AM - Car 19 called and stated that two more were spotted coming from the southeast, over Monroe County. Also that they were side by side. 4:56 AM - Monroe County [sheriff's department] stated that they just spotted the object, and also that they are having calls from citizens. Called Selfridge Air Base and they stated that they also had some objects [presumably on radar] over Lake Erie and were unable to get any ID from the objects. The Air Base called Detroit Operations and were to call back as to the disposition. 5:30 AM - Deputy Patterson and I [Cpl. Broderick] looked out of the office and saw a bright light that appeared to be over the Ypsilanti area. It looked like a star but was moving from north to east. During the rest of the week, the sightings continued, culminating in one of the most controversial cases of UFOs, and the most unusual explanation of Project Blue Book, stating the objects seen were only "swamp gas." Project Blue Book sent Dr. J. Allen Hynek to investigate the sighting reports. At first,Hynek agreed that there was something going on in the Michigan skies. But after consulting with the Blue Book headquarters, he changed his mind, and said that the sightings were nothing more than "swamp gas." In the last six weeks, there have been a very large number of reports coming from Michigan. Here are some of those. Michigan - 08-07-09 - My husband had taken the dog out. I was standing on the balcony of the house that attaches to our bedroom. My husband said to me "Honey, come down here. There's a weird planet. You’ll probably know what it is." Then he asked me if I knew if there was a cell phone tower nearby, and I replied that I thought there was indeed one nearby and that could be it. When I came down and met him outside, I realized that the direction where he was pointing there was no cell phone tower. I did see the large globe on the horizon. It pulsed and glowed a very bright red, but when it got closer (coming from the west) to us, it seemed to pulse back and forth between red and orange almost at the same time. Michigan - 10-01-09 - My dad is 82 and this is what he told me just recently. He seemed excited and this was his first ever sighting. In late September or early October of 2009 he saw an object. He was not going to call or write, but I told him that I would. At about 9:30 AM, he was sitting in the living room of his condo and saw odd lights through the skylight. It was a fairly sunny morning and he wondered what this could be. It was not a reflection through the skylight. He watched the lights and decided to get out his binoculars. Looking up, he saw a triangular-shaped object, tilted at an angle with lights at the corners. They were very bright. The object appeared to be gray in color, and it remained in the sky above his home for approximately 1 hour. He told me that it was cloud level, fairly high up, but he could definitely see the object pretty well. He watched on and off over the hour and eventually it was gone. Michigan - 10-04-09 - As I looked west out the window, a rising orange light caught my eye. At first I wondered if it was a planet. I stepped outside to take a closer look, and noticed that it was moving. I watched the light quickly move upward, arching slightly. My first reaction to this object was that it was moving abnormally quick. After watching it for a few seconds, I went inside to find my roommate, who was asleep. I noticed that the object had blinking lights of two different colors as it moved closer to me. The object was headed east. I watched the object move across the sky until it moved outside of my sight. I am not sure if it was in space, our inside our atmosphere. It passed right above the moon, so its silhouette was not reflected. I’m not sure if this was a true UFO. I was just extremely bewildered about its speed. Not only was this aircraft moving very fast, but as it had passed over me, it produced hardly any sound. I would estimate this object as being over a mile away. I continued taping until the object could not be seen as it passed behind the trees. There was no noise that I could detect. It also looked to be shimmering, or reflecting light. It was very puzzling to me. Michigan - 10-04-09 - I went out on the balcony of the cottage overlooking Round Lake to smoke a cigarette. As soon as I stepped outside, I noticed a bright, tall, box-shaped object moving across my view from the left. I saw it very clearly. It had three sets of multi-colored, blinking lights. It suddenly made a sharp right turn and the lights went out, and I could not see it. I went inside to tell my wife what I had seen. Then I grabbed my cell phone to use its camera in case I saw it again. I went back onto the balcony and almost instantly noticed another very bright object moving in the night sky towards my location. This object was a bright, white, disc-shaped object that had a round center. I was able to get a picture of this object before it turned, and then went straight up and at a high rate of speed. I have attached the picture I took. Michigan - 10-05-09 - I went out my backyard to a field that is an old golf course. I had my camera with me as I usually do. I noticed a bright white round ball in the sky. I began shooting pictures and then took some video footage of this object as it went from right to left (west to east). Michigan - 10-05-09 - An Ishpeming man is looking for answers to a strange sight in the September skies. It was a bright looking object over Hovey Lake in Alger County that caught the eye of Mark Perala. He took several photos on September 19 just after 8:00. He's not sure what they are, so he showed them to NMU Physics Professor David Lucas. "I started clicking pictures and that's when all of a sudden there's a bright object up here," explains Perela. "Then it's a ways out and then it's right here in front of me, and then I went and sat down and reviewed the pictures with my friends and showed them and they said "What the heck is that?"